Post your own dedicated giveaway for this event, from January 4, 2016 at 12:01a.m. until January 16, 2016 at 11:59p.m. This is an "open theme" giveaway hop. Giveaway prize must be family-friendly and worth at least $25.00. Blogs without giveaways posted by 9:00a.m. on January 4 with all required elements will be removed from the linky list. Times are ET. Signups close on January 1, 2016. You aren't required to post in advance of the giveaway hop, but if you'd like to add the button to your sidebar, please link it to this post so that others may join in too. 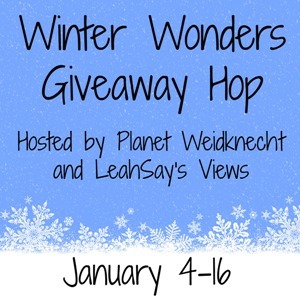 Giveaway Hop reminder and linky code will be provided at least one day before the hop begins, both by email and post in the Weidknecht Events Facebook Group. Sign up below with your name and main blog link if you'd like to participate!